Hiwot Haileslassie’s research focuses on improving iron and zinc bioavailability in pulses grown in Ethiopia using household-level food processing strategies. Hiwot Haileslassie is a PhD candidate under the supervision of Drs. Carol Henry and Robert Tyler. She has a BSc in Public Health and an MSc in Applied Human Nutrition and has worked as a lecturer at Hawassa University in Ethiopia. 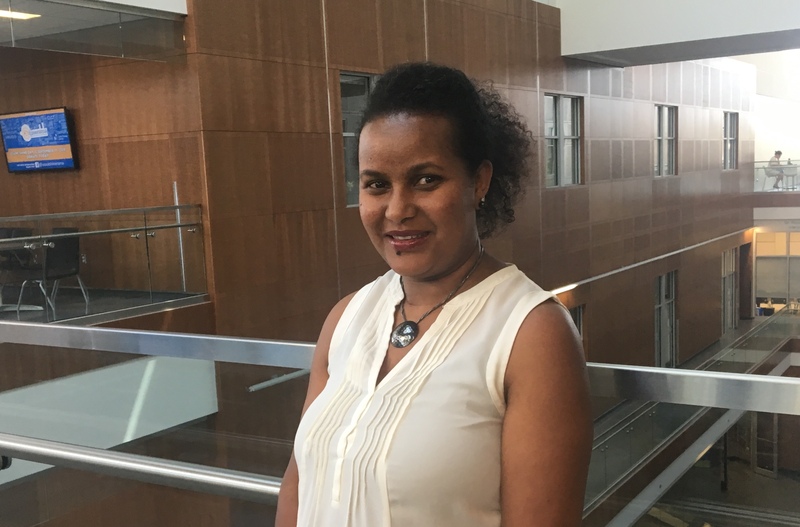 Hiwot’s doctoral research focuses on improving iron and zinc bioavailability in dry bean and chickpea grown in Ethiopia using household-level food processing strategies. During her PhD, Hiwot also managed a project entitled “Starting Young: Incorporating Local Pulses into the Menus of Childcare Centers in Saskatchewan” funded by Saskatchewan Pulse Growers and developed an educational resource. She has received a number of scholarships and awards, including the International Dean’s Scholarship, Saskatchewan and Innovation and Opportunity Scholarship, Elizabeth Helen McLeod Scholarship, and several conference travel and presentation awards. She was also an invited speaker at the Association of Saskatchewan Home Economists Annual Meeting and University of Saskatchewan Retiree Association Meeting and was featured as a young innovator in the Saskatoon StarPhoenix. Haileslassie H., Henry C., Tyler R Acceptance of soaked and germinated chickpea-based dishes. IUNS 21st ICN International Congress of Nutrition, Buenos Aires, Argentina, October 15-20, 2017. Haileslassie H., Henry C., Tyler R. Phyisco-chemical characteristics and iron bioavailability of chickpea and bean. CIFST national conference, Burnaby, Canada, Feb 22-23, 2016. Haileslassie H., Henry C., Tyler R. Household Food Processing Strategies to Improve Bioavailability of Iron and Zinc in Chickpea and Bean Based Ethiopian Dishes. Micronutrient Forum Global Conference, Bridging Discovery and Delivery, Addis Ababa, Ethiopia, June 2–6, 2014. Abebe Hiwot, Abebe Yewelsew, Loha Eskinder, Stoecker Barbara. (2014). Consumption of Vitamin A Rich Foods and Dark Adaptation Threshold of Pregnant Women at Damot Sore District, Wolayita, Southern Ethiopia, Ethiopian Journal of Health Sciences, 24(3):219-26. Wondimagegne ZelalemTafese, Birhan Yifru, Abebe Hiwot. (2013). Nutritional care and support among adults living with HIV at Hawassa Referral Hospital, Southern Ethiopia: A qualitative Study. African Journal of AIDS Research, 12(2):105-111. Saldanha Lisa S, Buback Laura, White Jessica M, Mulugeta Afework, Gebre Mariam Solomon, Roba Alemzewed Challa, Abebe Hiwot, John B Mason. (2012).Policies and program implementation experience to improve maternal nutrition in Ethiopia. Food and Nutrition Bulletin, 33(2 Suppl):S27-50. Zelalem Tafese, Birhan Yifru, Abebe Hiwot. (2012).Changes in nutritional, functional and immunological status of HIV-infected adults with antiretroviral therapy. Ethiopian Medical Journal, 50(1):75-87.